This trip has been interesting is many unexpected ways. When we were kids our family went on vacation one week a year and very often it took us up the coast of Maine. As I was driving up Rte. 95 the towns in which we had stopped passed by as nothing but roadsigns and memories – Kittery, Brunswick, Wisscasett. I’m not sure why but I feel like we often stopped at odd obscure places. It could be because my father always had far flung interests, most of which I didn’t realize were odd until I was far into adulthood. 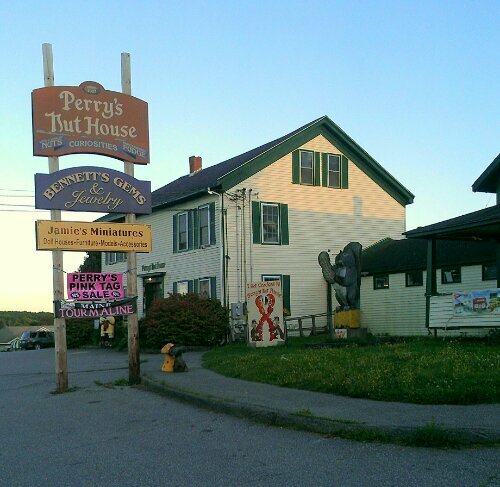 Or my mother had a healthy sense of humor that would take us to places like Perry’s Nut House. I’m wondering what makes someone stop at a place like that. Since it’s next door to the place I’m staying I think I will find out. This is a place we all remember, maybe only for its name. It’s probably been almost 50 years since I set eyes on it but its name has been in our storytelling forever. With any luck I’ll be able to report a fantastic experience and perfectly good reason why this has been part of our vacation history. I have a sneaking suspicion that most of it has to do with the name.